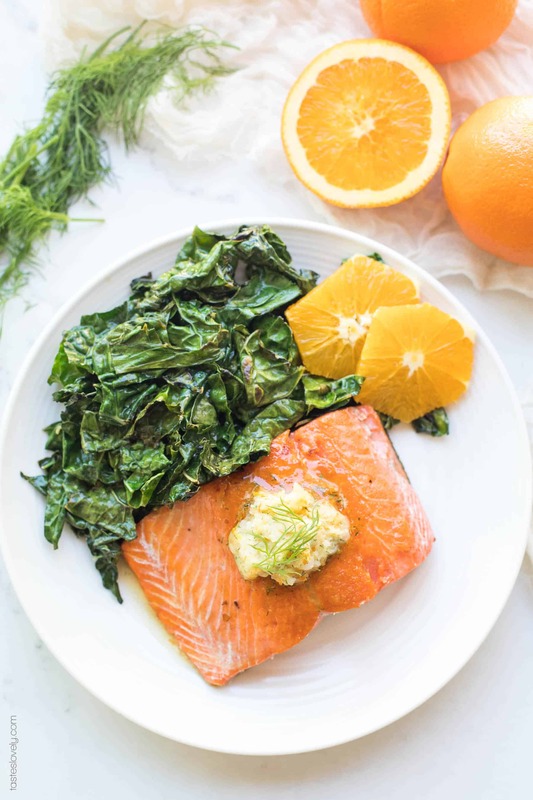 Paleo, Whole30 and Keto Salmon with Orange Dill Butter – a healthy 15 minute salmon recipe topped with a dairy free orange dill “butter”. Gluten free, grain free, soy free, sugar free, low carb, clean eating. 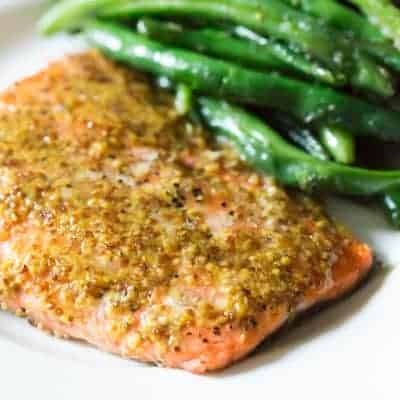 Another delicious and fast salmon recipe for you! This one is super fast. I can have this cooked and on the table in just 15 minutes, start to finish. Such a lifesaver for busy weeknights. I love serving a fish dinner once a week, usually wild caught salmon. My 2 year old loves it and can eat almost an paleo, whole30 + keto salmon with orange dill butter filet all to himself. Makes my momma heart so happy seeing him eat healthy. Making salmon so often, I’m always looking for more salmon variations to keep them interesting. 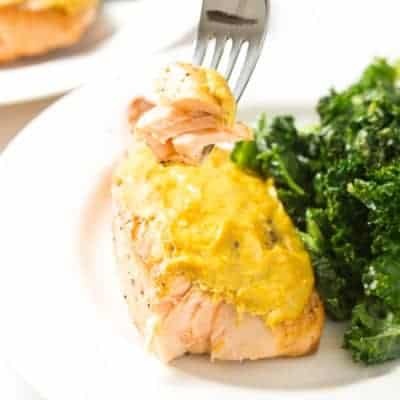 We already love my Paleo Maple Mustard Glazed Salmon, Paleo Pomegranate Glazed Salmon, Paleo + Whole30 Orange Mustard Glazed Salmon, and of course my Paleo, Whole30 + Keto Salmon With Lemon Dill Butter that this recipe is based on. 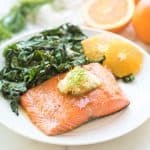 When I first made that Salmon with Lemon Dill Butter recipe (way back in 2014! 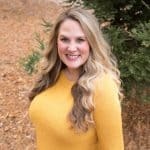 ), I was still eating dairy and using regular butter. But now we’re completely dairy free, and when I made it I would swap out ghee and it was good, but not as good as it was with real butter. I was determined to find a better butter substitute. Coconut oil! It is a much butter substitute than ghee. It works perfect! It stays firmer at room temp, and with some salt added in it mimics butter perfectly. I just combine coconut oil, dill (fresh or dried works), orange zest and salt. 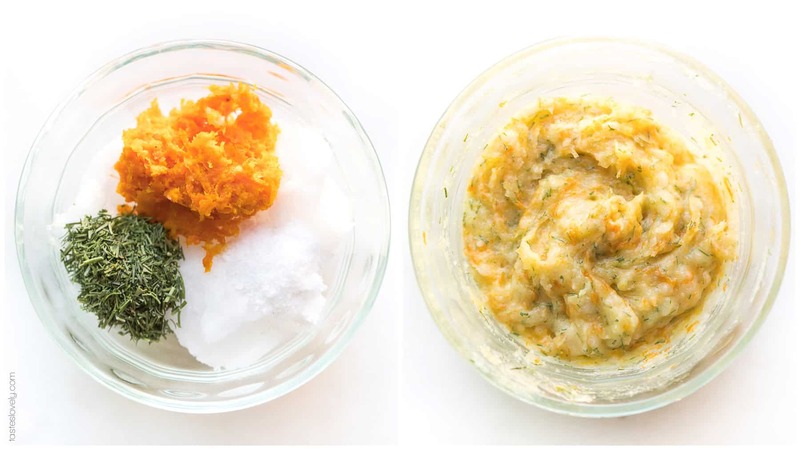 Mix it up, and you have the most delicious paleo, whole30, keto and dairy free orange dill butter! It is so perfect on top of the salmon. If you don’t mind a hint of coconut taste (I love it! ), you can use regular virgin coconut oil. But if you want to avoid any coconut taste, get filtered coconut oil. Trader Joe’s has a great triple filtered coconut oil that has no coconut taste whatsoever. 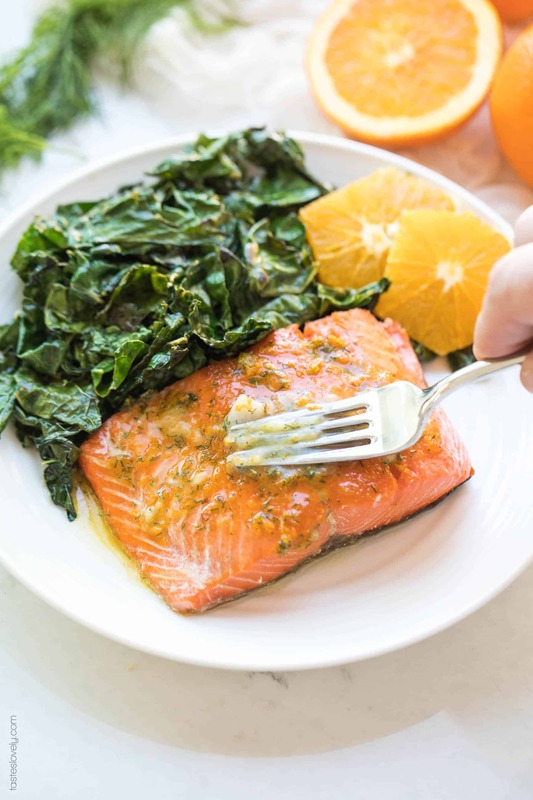 The key to getting a good crust on this salmon paleo, whole30 + keto salmon with orange dill butter, and not having it get dried out, is to cook it fast and a high temp. I cook my salmon over medium high heat for just about 5 minutes per side. It’s also very important to get the salmon completely dry. Any moisture on the salmon will create moisture, therefore causing steam. When it’s dried properly, it can get the golden crust. I use a meat thermometer to tell me when the meat reaches 125ºF. As soon as it reaches 125ºF, I pull it out of the pan immediately because it will continue cooking off the heat. The salmon will reach about 130ºF while it rests, which is “medium” for salmon. Exactly how I like it. 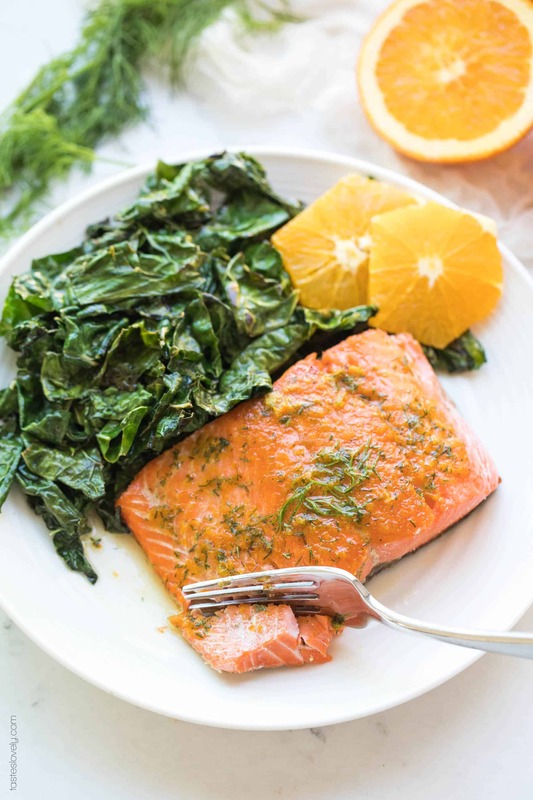 I usually serve this salmon with orange dill butter with some sauteed kale, that I sautee in olive oil and finish it with a squeeze of fresh orange to complement the flavors. Delicious! More importantly, so healthy! 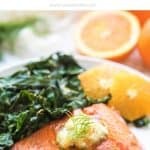 This salmon with orange dill butter is paleo, whole30, keto, dairy free, gluten free, grain free, soy free, sugar free, clean eating, real food. 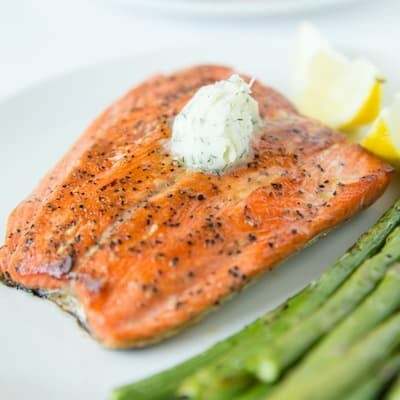 Using paper towels or kitchen towels, pat the salmon filets completely dry to remove any moisture. This allows the salmons to get a good sear and crust. Season generously with salt and pepper. Add the coconut oil to the pan and sear the salmon. If the salmon has the skin, start it skin side down. Cook the salmon until it is golden brown and has in internal temperature of 125ºF. Usually around 5 minutes per side. While the salmon is cooking, making the orange dill butter. In a small bowl, combine the coconut oil, orange zest, dill, and kosher salt. Stir to combine. 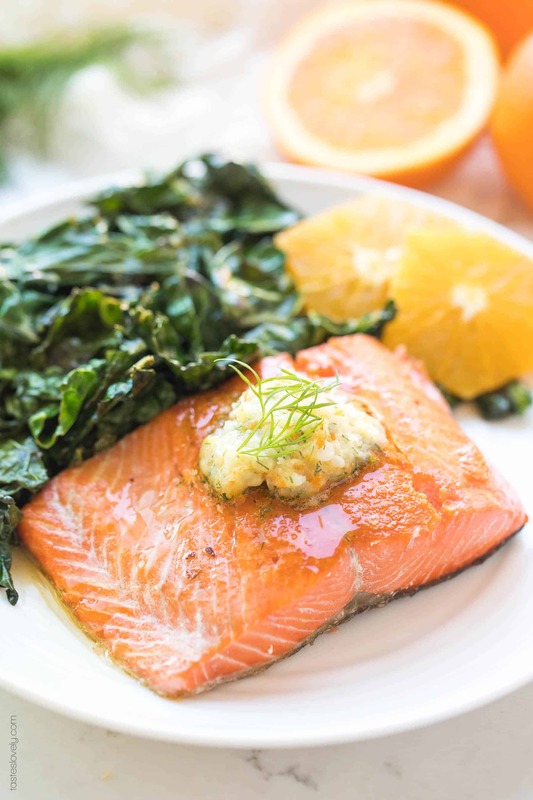 Serve the salmon warm topped with the orange dill butter and a wedge of fresh orange. I’m so glad you liked it Mimi! Thank you!